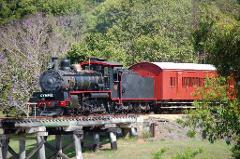 Join your Mary Valley Rattler experience departing the historic Gympie Station. Hop aboard a lovingly restored heritage carriage as you make your way through the stunning Mary Valley. Bookings required to avoid disappointment. 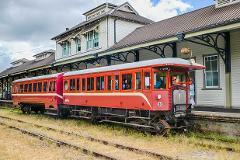 Join your Mary Valley Rattler experience departing Amamoor Station at 11:00am. Hop aboard a lovingly restored heritage carriage as you make your way through the stunning Mary Valley. Bookings required to avoid disappointment. All aboard The Rattler Picnic Train! Join your three hour journey through the stunning Mary Valley from the historic Gympie Station on the vintage RM76 railmotor with time to enjoy a leisurely picnic at the heritage Amamoor Station. 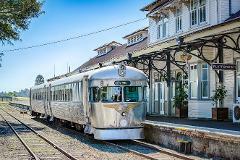 Step back to the 1960's aboard the diesel railmotor; The Silver Bullet, for a return journey to historic Monkland Station followed by lunch at the Platform No.1 Cafe. Bookings required to avoid disappointment. Enjoy lunch at the Platform No.1 Cafe after stepping back to the 1960's aboard the diesel railmotor; The Silver Bullet, for a return journey to historic Monkland Station. Bookings required to avoid disappointment.